1993 was a big year for me in my adventures in film. It was the year that I watched the two films that made me want to be a filmmaker. Hard Boiled was the first film I saw and I was blown away by the artistry of the violence and entranced by the way that John Woo not only shot the film but also how it was edited. I told myself after watching Hard Boiled, "That is what I want to do. I want to make action movies just like John Woo." The second film was today's trailer, Jason Goes to Hell. My father took me to see the film and we enjoyed ourselves throughout. Not for the reasons that the filmmakers wanted though. Me and my father laughed our asses off during the entire film. 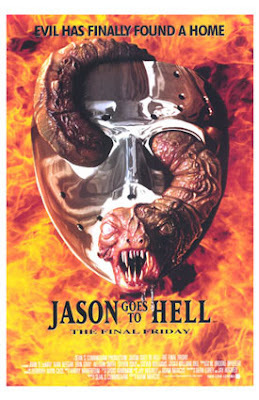 I am sure that there were some Jason fans who were pissed that we were laughing at their idol, but even they had to admit that the film was terrible. I told myself after the viewing "I can do better than that."